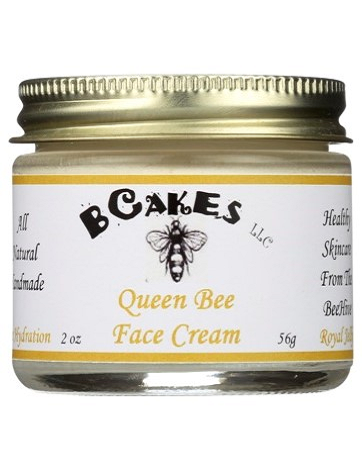 Our Queen Bee Face Cream provides intense moisture for dry, mature skin & wrinkles. Contains Royal Jelly. 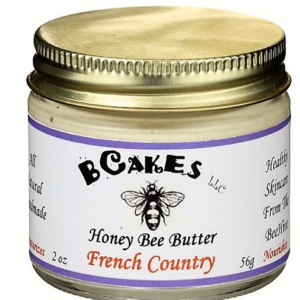 A blend of cold-pressed oils & butters, including Rosehip Oil & Royal Jelly, to naturally moisturize, nourish & protect dry skin, making lines & wrinkles less noticeable. We suggest using after bathing to seal in moisture. A little dab will do your whole face. If it doesn’t soak in after a couple of minutes, use less the next time. I met you a few weeks ago doing a demo… (I provide accounting services and gave my business card to you, P.B.). I went back a couple of days later and bought the Queen Bee cream. I LOVE IT! I have tried for years to use something that didn’t irritate my skin and make it red, that did not clog my pores and feel greasy, and that did not have a ton of chemicals. The only thing I found so far was pure shea butter, but it could be a bit heavy. I have found I love the Queen Bee cream. It is perfect! It feels great, no irritation, no clogging, no unwanted chemicals or extra smells, and my skin feels moisturized and protected. Like it is holding the good stuff in. And even when I wash my face, it no longer feels dry, like the Queen Bee has made a difference in the fundamental moisture level in my skin, not just superficial. I feel like it has reduced the fine lines and and aging as well as the dryness. Thank you, thank you!! I had my very particular mom try some (she is over 80 and has similar skin issues) and she asked me to go get a jar for her. Just wanted to let you know what a totally wonderful product this is and I will tell my friends all about it. I wish you the best and am so happy I have found something that feels great and is really beneficial for my skin. Just a quick note to tell you that I bought your face cream at … and I am SOLD! I love this product. My skin feels awesome.